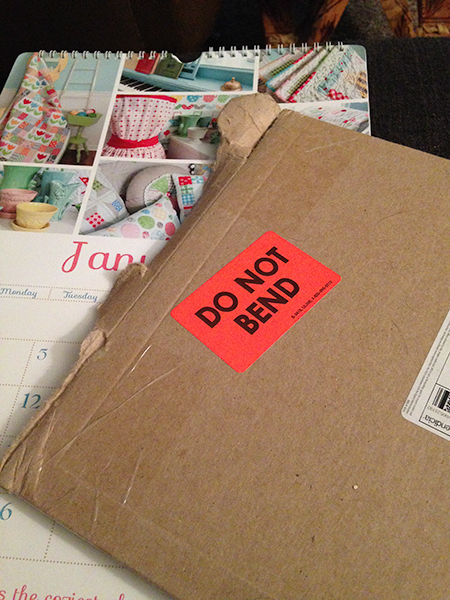 I’m happy to report my Lori Holt calendar was not bent. But..
Go ahead and step on it. It’s okay. 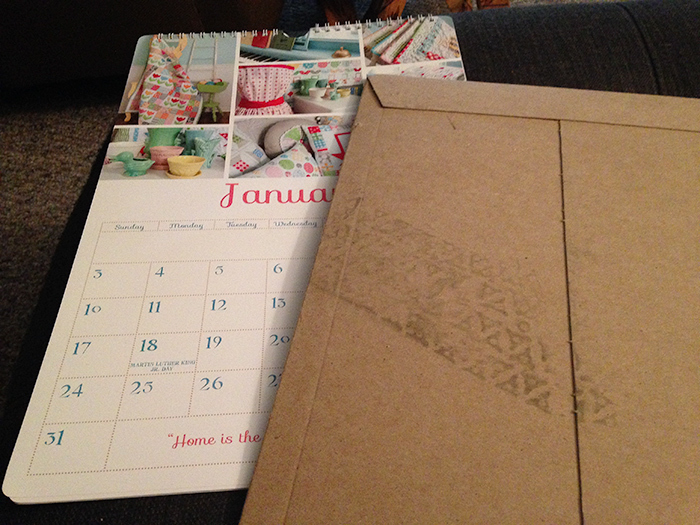 Happily, I got my Lori Holt calendar in the mail! Hooray! It’s filled with cute little patterns of houses and flowers and stuff. I love her style. “Home is the coziest place to be.”. I’ll hang up this calendar in my sewing room and will pull out the little cabin patterns to make another time. While I was trying to use only what I had these days, I will use these patterns to use up the fabric I have. THAT is how I justified spending my Christmas money on this. And I have decided not to buy any fabric until I’ve made a dent in what I have with the exception of STAR WARS fabric. I hear they have it at Fabricana (or Fabricland? Oops. I can’t remember now). It’s hard to find (or so they told me at Dressew), so one day I’ll make some pillow cases. For some reason, I have it in my mind that I need to make STAR WARS pillow cases. Dare to dream! I can make this happen. Weird. I’ve been preoccupied with sleep, I think. The electric blanket, the diffusor with sleepy smells in it and now the pillow cases. Still. I must make some. This entry was posted in Edibles, General, Photos and tagged cute fresh and cheerful, dreamy, I love her style, Lori Holt, pillow case obession, star wars fabric. If it wasn’t meant to be stepped on, there’d be a “NO STEP” sticker on it. So me thinks it’s fair game.